The ten unfortunate skiers, only Joeri Joedin (bottom right) survived because he accidentally fell ill the day before the expedition. 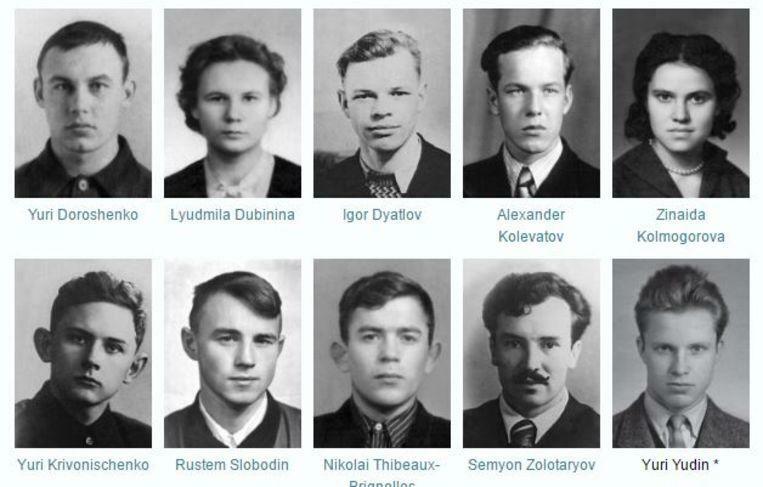 The Russian television and public prosecutor reopen the perhaps greatest mystery of Russia: the Dyatlov pass incident, in which nine skiers died in bizarre circumstances. Either a horror story from the Urals full of conspiracy theories. The Dyatlov pass incident – It takes place on a mountain pass on the eastern side of the ‘dead mountain’ in the northern part of the Ural Mountains – was controversial in 1959. From a group of ten skiers (eight men and two women and almost all students or graduates from the then Polytechnic Institute of the Urals (UPI), now the State Technical University of the Ural, ed. ), Only one returned. Due to avalanches and sudden, extreme, weather changes, accidents had often occurred in the inhospitable area. But what happened to the group about which the 23-year-old student Igor Dyatlov was in charge was special. A number of members of the ravaged expedition were found dead and frozen at the edge of a forest hundreds of meters from the tent camp, dressed only in their underwear. The tongue was missing for another person who lay a bit further away. Two months later, the remaining four last bodies were found under a thick layer of snow. Obviously, these seem to wear the clothes of the other expedition members who had been found before. Radiation would have been detected on those clothes, and the bodies had severe injuries to the head and chest. A tenth member of the group escaped fate because he fell ill before the last leg of the trip. According to the Soviet authorities of that time, the victims have died of hypothermia after an avalanche. The case was closed after three months, after the same length of access to the area was strictly forbidden. Another group of students who were nearby at the time of the facts claimed to have seen flying lights strangely enough. The result: conspiracy theories. Back then, in 1959, all the bizarre rumours circulated. Were the unfortunate victims perhaps attacked and mutilated by extra-terrestrials? Had the terrible snowman or a relative of them taken to sea or had they accidentally ended up in a nuclear test area and paid for it with death? Because there were no survivors, no witnesses, and the drama also took place in extreme weather conditions at the time of a strict regime that was all about mystery, decades have been speculated about what really happened to the nine skiers. It makes the Dyatlov pass incident one of the biggest riddles of the Soviet Union (then) and Russia (now), according to the Russian television station TV-3, which announced the new series under the title: ‘The Pass of Dyatlov’. Earlier, several books and films and documentaries about the mysterious events appeared. Almost simultaneously, a Russian prosecutor, Andrei Koerjanov, reported that the investigation into events has reopened. The detective who led the investigation at the time died. There are now 75 different theories studied in the hope of finally closing the case after sixty years. “We have excluded the most fantastic theories with kidnappings by extra-terrestrials and paranormal apparitions. However, new autopsies will take place”, according to Koerjanov. The prosecutor revealed that some of the serious injuries had actually developed post-mortally. Possible due to the extreme cold (minus 30 degrees) in the area. “Our family members, the media and the public still ask our researchers to find the truth,” according to Koerjanov. “People make no secret that they think the truth is being withheld.” The hope is that now unopened documents may be looked into. But the myth is strong. The next of kin declared that the hair and skin of their loved ones were bizarre orange and gray. That would have had to do with nuclear contamination, according to conspirators. The drama played in the middle of the Cold War, during which Russians and Americans tested all kinds of weapons. Perhaps the group of Dyatlov had some bad luck in a secret military test area? But according to experts, the most logical explanation would be that the expedition ended up in an avalanche and that startled survivors started to look for totally confused help. A known phenomenon is ‘hypothermia’. Sometimes victims of this even dress up in icy conditions because they think they are too hot in their confusion. Then it will soon end.